In my last post, I introduced you to the art of printmaking and discussed relief print techniques in more detail. 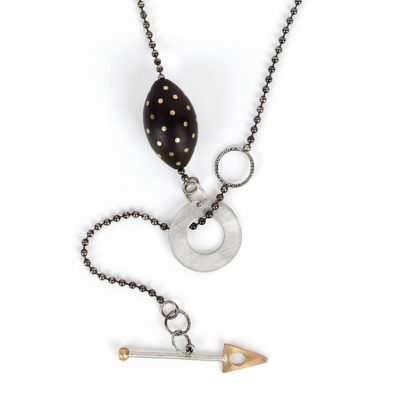 Next, we’ll explore another popular discipline: intaglio. While most relief prints are created by carving wood or linoleum blocks, intaglio prints are created primarily from metal plates (e.g. 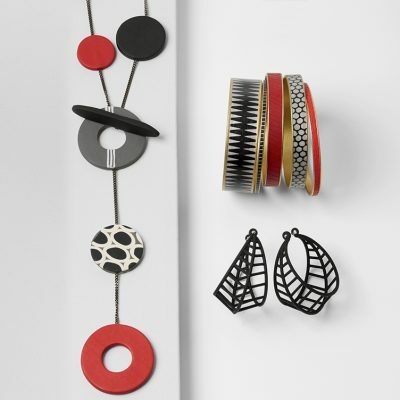 copper or zinc), though glass, plastic, and other materials can also be used. 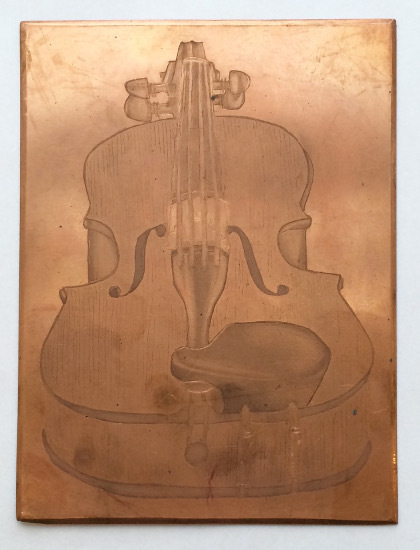 An example of a copper intaglio plate (created by yours truly). 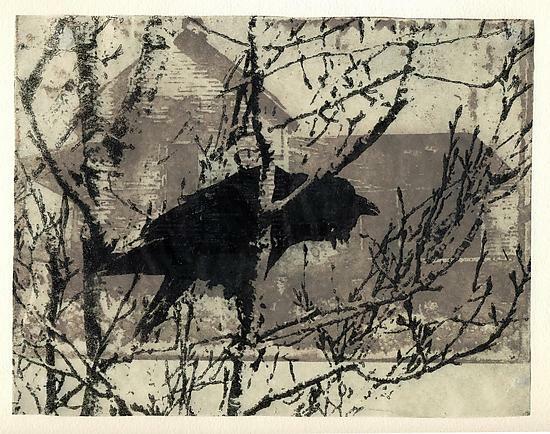 While relief techniques result in areas of positive and negative space, intaglio techniques can create anything from fine lines to rich tonal gradations. 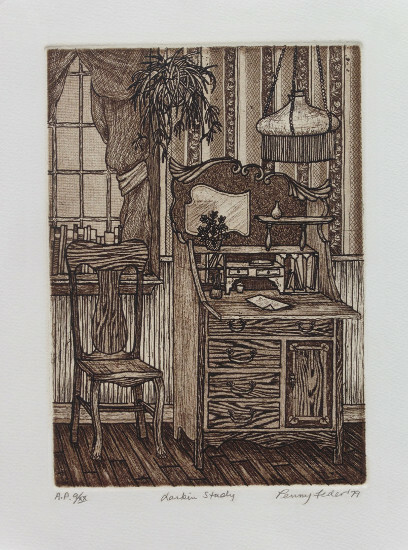 This etching by Penny Feder is a good example of the variety of marks and tones possible with intaglio. 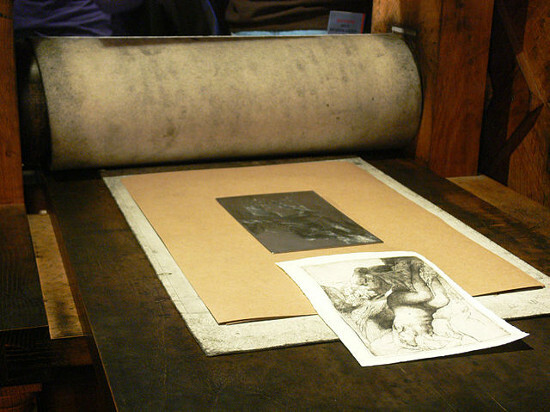 In relief printing, the artist removes the areas not to be inked, and ink is then rolled onto the surface of the block. Intaglio techniques are the reverse: the marks that the artist makes will hold the ink, while any smooth surfaces will appear white. After the block is inked, a damp sheet of paper is laid over it, and both are run through a printing press to create the final piece. An intaglio plate and resulting print on a press. Photo by Remi Mathis (via Wikimedia Commons). There are a wide variety of methods for creating images in intaglio printing. 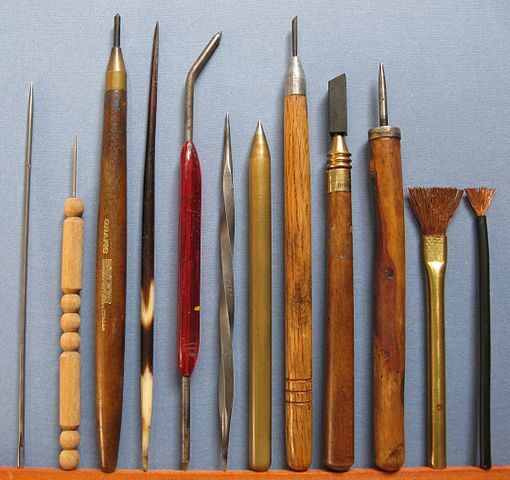 The simplest is drypoint, which involves directly cutting, scratching, and carving into the plate with hand tools. Other techniques involve more complex preparation than drypoint, yet allow for a greater range of artistic possibilities. Etching, for example, uses acid to “bite” or etch an image into the plate. To create an etching, the artist first coats her plate in an acid-resistant ground. She then carves into the ground, rather than the plate itself, selectively exposing the metal beneath. 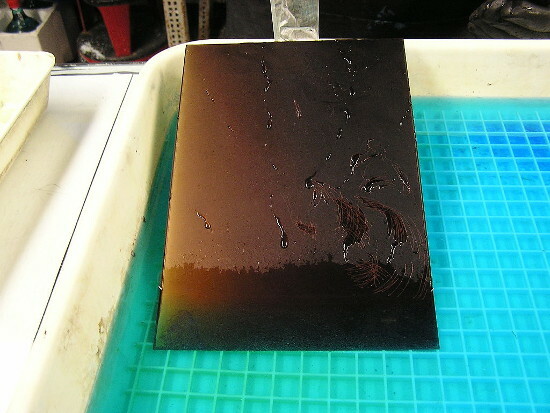 The plate is then submerged in an acid bath, which will “bite” the exposed metal. After removing the plate from the acid and cleaning off the ground, the plate is ready to be inked and printed. The black lines are etched, while the areas of color are painted by hand. Aquatint is another etching technique. Areas of shading are created by first dusting the plate with fine particles of rosin. When the plate is submerged in an acid bath, the acid bites around the particles, creating tonal areas with a fine texture. There are several variations on the aquatint technique, including spit biting and sugar lifting, which artist Barbara Stikker used to create the print below. 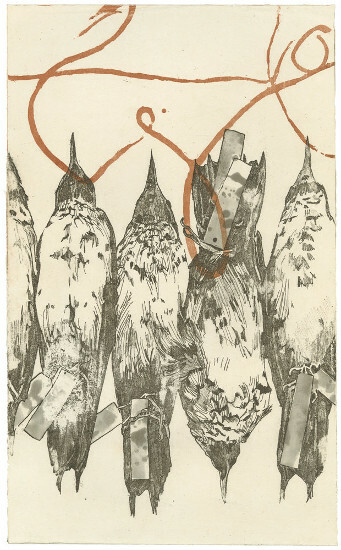 Collection by Barbara Stikker is a two-plate etching that incorporates several aquatint techniques. Mezzotint is a subtractive technique. That is, instead of beginning with a smooth plate that holds no ink, the artist begins with a fully textured plate that prints black. He works from dark to light, using tools to smooth and burnish areas to lighten them—”subtracting” the color. 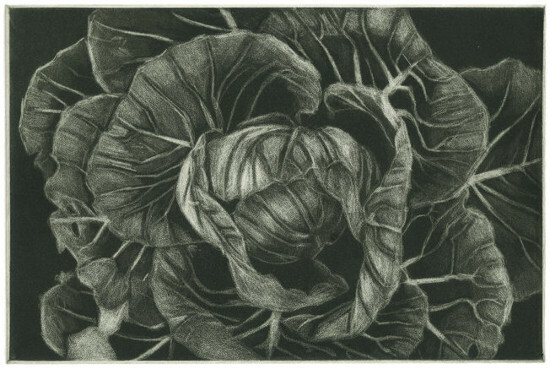 Cabbage by Barbara Stikker. Though not a true mezzotint (it’s actually an aquatint), this etching was created using similar subtractive techniques. The photo etching technique uses a light-sensitive emulsion to create marks on a plate. 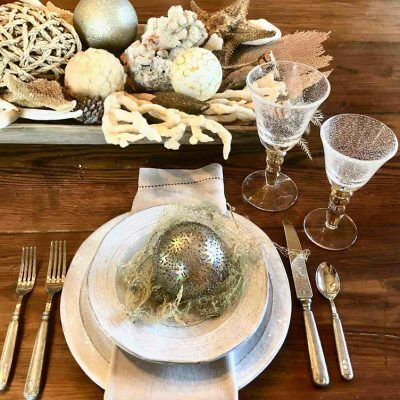 It is a great way to incorporate original photographs, drawings, or other pre-existing imagery into a print. The artist first creates or reproduces an image onto transparent film, places it over the light-sensitive plate, and exposes it to light. 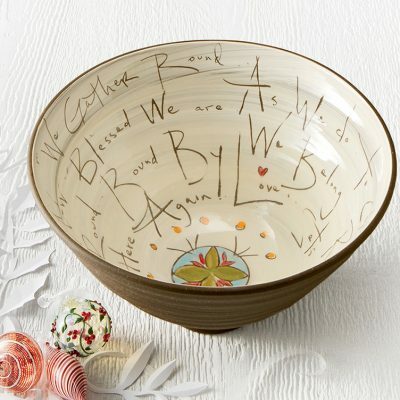 Next, the plate is developed and etched; it can then be further altered or inked as is. Mill Road by Midge Black is a photo etching created from two different photographs with additional drypoint, aquatint, and etched details. A vitreograph is an intaglio print created by etching a glass plate. This technique was pioneered by Harvey K. Littleton, a seminal artist considered to be the father of the studio glass movement in North America. It is fascinating to see Littleton’s dedication to the medium of glass even in the creation of two-dimensional work. Intaglio is a complex and rewarding area of printmaking with a wide range of techniques and artistic effects. In my next post, I will touch on a few additional techniques, explore one-of-a-kind prints, and explain the difference between traditional prints and giclee prints.